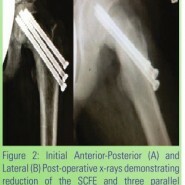 Surgical Technique on screw removal in case of broken screw in SCFE. Department of Orthopaedics, Wayne State University Orthopaedics. Dr Nathan A. Jacobson M.D., Wayne State University Orthopaedics, 10000 Telegraph Road, Taylor, MI 48124. Email: njacobso@med.wayne.edu. Phone: 661-428-8567 / Fax: 313-3757226. Introduction: SCFE occurs in 10 per 100,000 in some regions of the United States with the incidence continuing to increase. Percutaneous screw fixation is a well-accepted treatment for this disorder for over 20 years but management of complications is not well elucidated in the literature. 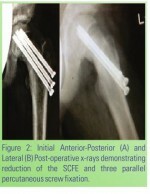 Case Report: We describe a case where a traumatic unstable SCFE that was initially treated with closed reduction and fixation with a single transphyseal screw went on to hardware failure with recurrence of the deformity. The complication was successfully treated with closed reduction and re- cannulating the fractured screw within the epiphysis and extracting it using a conical extraction screw commonly referred to as an “easy out.” Three trans physeal screws were then placed for improved fixation strength. 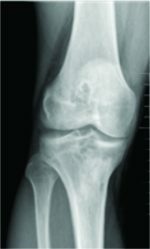 Follow-up at 9 months demonstrates a fused physis and no signs of avascular necrosis of the femoral head. Conclusion: Percutaneous management of SCFE screw breakage is possible utilizing specialized instruments and a precise and gentle manipulation preventing the need for more invasive treatments with their obligatory potential complications profile. Keywords: Hardware Failure, Slip Recurrence, SCFE, Complication, Conical Extraction Screw, Easy Out.